Sunday, December 2, 2018, 3-5 p.m.
Join us for an afternoon of holiday cheer at the Dawes House. 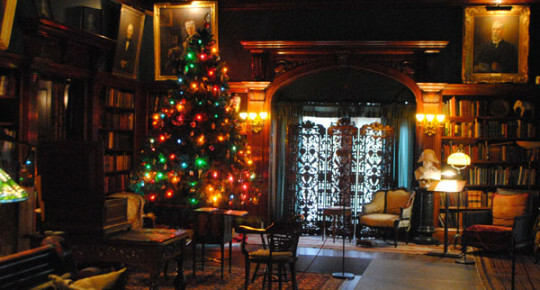 Explore the majestic lakeside mansion decked out for the holidays, view EHC’s exhibits, and enjoy holiday treats and live music in the Great Hall. EHC also kicks off its 13th Annual Holiday Food Drive, conducted in partnership with the Greater Chicago Food Depository. All food collected will go directly to an Evanston food pantry to benefit area residents. Donations of nutritious, non-perishable food (no glass, please) will be accepted at the Dawes House, 225 Greenwood Street from Thursday, November 29 through Sunday, December 1 from 1 p.m. – 4 p.m. each day, and Sunday, December 2, 3-5 p.m. Please consider donating to this important cause.